Aloo gobi paratha recipe - This aloo gobi paratha is prepared by using potato and cabbage as main ingredients in the dough. I have made this paratha by using the method of mixing the ingredients, kneaded the dough to soft, rolled to round and then shallow fried with ghee. If compared to the stuffed parathas, this method is much better and can be rolled very easily. By using this method any one can prepare parathas very quickly. This method is popularly known as thepla. Aloo gobi paratha is a very tasty and healthy dish that served for breakfast, lunch or dinner as main. 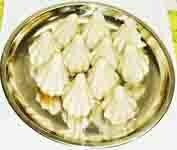 Its usually served with ghee and other tangy side dishes such as yogurt, pickles and chutneys along with some drink like buttermilk or lassi. Simply because of its wholesome nutrition, the parathas prepared with whole wheat flour has significant role and priority in my menu list. The stuffed parathas can also be made using the same potato cabbage mixture. Note that while cultivating the cabbages, lots of insecticides are being used. Therefore to get rid of insecticides, separating the cabbage leaves and wash them thoroughly before its use is necessary. 1 cup boiled grated potato. Boil the potato till it becomes very soft. Peel and grate it. keep it aside. Roll couple of cabbage leaves together and grate them using a grater. In a pan heat 2 tsp of oil and add grated cabbage to it. Saute for 1 minute. Add chilli powder, turmeric powder, coriander powder and cumin powder to it. Saute for 2 minutes and cook on medium low flame till the cabbage becomes slightly soft. Then remove from the heat and allow it to cool. Once the cooked cabbage mixture becomes cool, add grated potato, gram flour, curd, coriander leaves and salt to it. Mix well till all the ingredients combine well. Wrap a clean plastic sheet around the chapati board. Now add wheat flour to it and knead it to a dough of rolling consistency. Add more wheat flour if required. Take small orange sized portion of dough and make round ball from it. Roll this dough ball into wheat flour and roll out thin and round roti from it. Roll out as much thin as you like. Repeat the same process to all parathas, roll and place them on a plate. Now heat a griddle and apply ghee/oil on it. Shallow fry the parathas till the brown spots appear from both sides. Serve hot with yogurt, pickle and chutney along with butter milk. 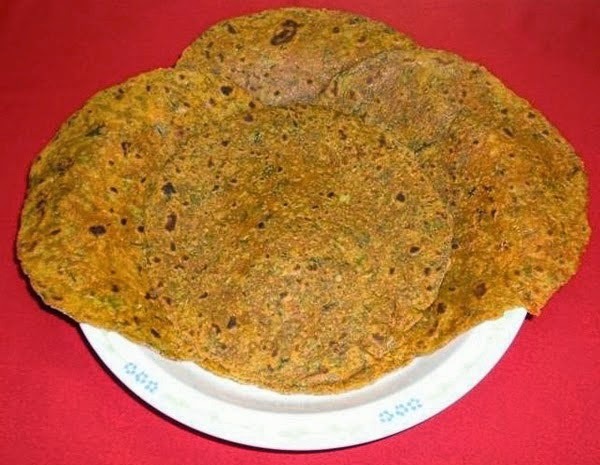 Lovely variation of thepla/paratha. Yummy and healthy. love the color of the parathas, perfect breakfast. Nice and healthy combination.. looks great!! very very delicious combo for paratha and they look so yummy ! !